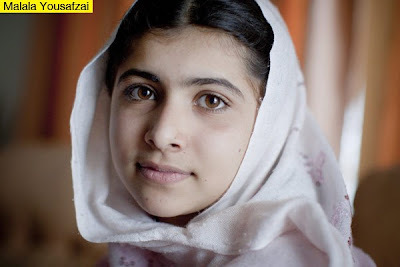 Malala Yousafzai is in my view the bravest, most courageous, youngest education activist in the world today! And on what the UN dubbed "Malala Day," she visited the United Nations on her 16th birthday to speak about education, women's rights and equality of opportunity July 12th 2013. In her inspiring speech, she said, "I am the same Malala,"..."but nothing changed in my life except this; weakness, fear and hopelessness died! Strength, power and courage was born," showing that her terrifying attack from the Taliban has not stopped her from fighting for what she believes in. I dub her 'a symbol of freedom.' For some this may seem like a tall order and an unbelievable amount of pressure to put on a 16-year old girl, but Malala has proven that she is willing to accept the burden and to continue to inspire countless others into positive action. "We call upon all the governments to fight against terrorism, to protect children from brutality and harm. We call upon the United Nations to expand opportunity and education for girls all over the world. We cannot all succeed when half of us are hampered. I am the same Malala. My ambitions are the same. My hopes are the same and my dreams are they same. I am not against anyone. Nor am I here to speak against the Taliban or any other terrorist group. I am here to speak up for the right to education of every child. Here I stand not as one voice but speaking for those who have fought for the right to be treated with dignity, their right for equality of opportunity, and their right to be educated. In many parts of the world, women and children are victims of child labour, forced to marry at an early age, and every government and world leader should stand up for women's and girls' rights, including compulsory free education for every child. When we were in class in Pakistan, we realized the importance of pens and books. The extremists were afraid of education....That is why they're blasting schools every day, because they're afraid of progress, afraid of change. No one can stop us. If we want to achieve our goals, let us empower ourselves with a weapon of knowledge and shield ourselves with unit and togetherness. Let us pick up our books and our pens. They are our most powerful weapons. One child, one teacher and one book and one pen can change the world. Education is the only solution. Education first." What are your thoughts? What impact, if any, does Malala's story have on your life? Can you identify with her testimony of strength, power and courage being born out of weakness, fear and hopelessness? I have! What about you? Will love to hear from you. Also, if you were inspired by this story, then help me share it with others so that their lives are also blessed and inspired. She is a very brave girl indeed! She has gone through so much, with so many attempts on her life, that her standing today is a living testament that she will not be scared into silence. Hi Kalley I am so inspired by her courage, her bravery and her tenacity..I love her determined spirit also that she will not be scared into silence. Have a great day and thanks for leaving comment. Such a strong, positive role model, especially for the youth. May her light of hope continue to shine brightly for all the world to see. Definitely Janelle! Be blessed and as always your support and contribution to my blog is well appreciated.